A phone tree or phone menu is an automated navigation menu presented to voice callers. Using interactive voice response with DTMF codes (touch tones) or voice recognition, a phone menu helps a caller find automated information, complete a transaction, talk to the proper human operator, or leave a voicemail with a company. Interactive Voice Response is the key to a phone menu, allowing incoming callers to interact with vocal prompts to find the right department or information, leave a voicemail, or complete common transactions. Commonly, phone trees understand DTMF tones emitted from a touch-tone phone, although some advanced systems use voice recognition to assist incoming callers. Why Use a Phone Tree or Interactive Voice Response? Even though phone trees ostensibly have a negative reputation, they're actually a massive time saver for your customers and your business. Your customers can complete common transactions or receive requested information (e.g. account balances or transfer dates) simply by punching in credentials on a home phone or mobile device. When they call in for support or sales information, your business logic can route them to the right people without them having to talk to multiple levels of support first. On the business side, a phone tree is the perfect complement to human operators in your call center. By triaging crucial support and sales tickets while handling common information requests, you'll increase the throughput of callers supported by the staff in your call center. With the right business logic in place, your call center will never sleep - see our IVR Tutorials page to see how easily you can add voicemail and text transcription to a Twilio IVR setup. 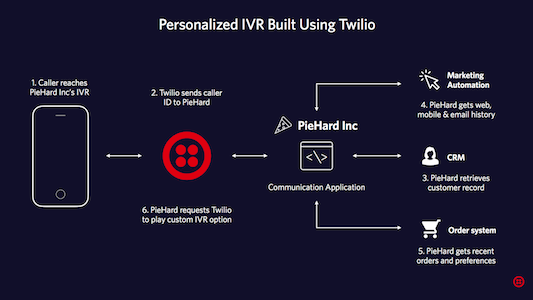 Once you're developing your IVR setup, Twilio has the integrations you need as you build toward your IVR phone tree goals. Twilio's Programmable Voice has DTMF support baked in, while our Understand API can help you add IVR voice recognition. Taskrouter can handle your toughest workflows and intelligently route incoming callers to the proper resources and operators. Of course, we're always here to help you take the first step if you'd like guidance - talk to sales to get started today.